Favoring a greener environment is like favoring school reform: it's a lot easier to say you're for it than to bring it about. In January a coalition of environmental and civic groups developed a "Green Growth Platform"—20 steps for the next mayor to take to make Chicago greener. The steps include increasing funding for the CTA, reducing traffic congestion, improving the energy efficiency of city buildings, and supporting bicyclists, pedestrians, and locally grown food. The mayoral candidates were asked if they were on board. All six answered "yes" to almost every step. So who's greenest? To seek an answer, it's necessary to look closely at the candidates' responses to the Green Growth Platform, and at their records too. Miguel del Valle, Rahm Emanuel, and Gery Chico elaborated on most of their responses to the questionnaire circulated by the coalition—17 groups including the Active Transportation Alliance, the Environmental Law & Policy Center, the Sierra Club, and Environment Illinois. But while Emanuel and Chico tended to reiterate the concerns of environmentalists without offering concrete proposals or promises, del Valle gave longer and more specific answers, often citing studies and statistics and going into detail on how he'd fund and carry out his proposals. Patricia Watkins and William "Dock" Walls offered a few brief comments, and Carol Moseley Braun didn't comment at all beyond indicating her support for every issue. Del Valle also found time to discuss his positions with the Reader. Spokespersons for Emanuel and Chico said their candidates weren't available, and Braun's office didn't respond to interview requests. The Fisk and Crawford coal-powered plants emit five million metric tons of carbon dioxide a year, as well as sulfur dioxide and particulate matter, into the Latino-immigrant neighborhoods of Pilsen and Little Village. Del Valle joined environmental groups at a press conference last summer in support of the proposed Chicago Clean Power Ordinance, which would force the plants to shut down or convert to natural gas. Chico, who frequently invokes his childhood in the Back of the Yards neighborhood not far from one of the coal plants, said he supports the ordinance. Emanuel didn't go that far, but he pledged to work closely with state and federal regulators and the City Council to make sure that Midwest Generation, which owns the plants, cleans them up "either by installing the necessary infrastructure to dramatically reduce the pollution they emit, or by converting to natural gas or another clean fuel." Local and national environmental groups have called on Emanuel to explicitly back the ordinance. "Chicago residents need to know whether he stands with the people in protecting the public health or with polluters like Midwest Generation," said Edyta Sitko, a Greenpeace field organizer based in Chicago. Emanuel has been criticized for his stance on climate change and carbon reduction while he was in the White House. Environmentalists accuse him of discouraging President Obama from pursuing an aggressive energy or climate bill that would put a "price" on carbon emissions and force companies to greatly scale them back. He reportedly advised Obama not to bring up climate change when commenting on the BP oil spill. In a commentary published last summer on grist.org, Eric Pooley, author of the 2010 book The Climate War, called Emanuel "an obstacle to climate action." Pooley quoted an unnamed cabinet member as saying, "You had this incredible green cabinet of really committed people, but the only thing that really matters is what the president says—so everyone was trying to get words [about carbon limits] into his mouth. And Rahm was trying to keep the words out of his mouth." Along with closing or cleaning up the coal plants, environmental and planning groups say the new mayor must back the creation of new local renewable energy sources. The candidates all agree that the city and affiliated agencies should buy at least 20 percent of their electricity from renewable sources by 2014, and all but del Valle agreed to require all new and substantially rehabbed buildings to be wired to accommodate on-site renewable energy, such as rooftop solar panels, by 2014 (though not necessarily to produce such energy). Del Valle said he supported the concept but not the mandate. Green advocates say the new mayor will need to address not only where Chicago's power comes from but how it's distributed, because a "smarter" grid would reduce both electricity use and the risk of power outages. Henry Henderson, who in the 1990s was Chicago's first commissioner of the Department of Environment, is today midwest director of the Natural Resources Defense Council. He observes that changing the electric grid and the sources of the city's power will require the mayor to negotiate with the state legislature, the Illinois Commerce Commission, the utility companies, and the Illinois Power Agency—and also seek input from the city's business interests. All these bodies have a say in how power is priced and distributed in Chicago, and serious reform of the city's energy sector will require much greater political skills from a mayor than the mere ability to ram an ordinance through the City Council. Replying to the questionnaire, all the candidates said they'd try to make Chicago a hub of high-speed rail. All said they'd lobby for federal and state funds to expand Chicago Transit Authority service. All would demand pollution controls on CTA buses. Del Valle pledged to advocate for more equitable state funding of Chicago, suburban, and downstate public-transit programs. "The Chicago area currently gets 45% and downstate gets 55% of state transportation funds even though the Chicago region represents 70% of the state's population and 78% of the state's economy," he wrote. Biking advocates have lauded Emanuel's detailed plans that include 25 miles of new bike lanes each year during his first term and the completion of the $75 million, 2.65-mile elevated Bloomingdale Trail on the north side. As Obama's chief of staff, Emanuel was a major backer of high-speed rail. He's released a detailed plan for easing road traffic congestion here and has touted his support for the CREATE program, a public-private partnership aimed at reducing congestion on the freight lines through Chicago. When freight trains are stalled waiting to get through the city—sometimes for days—residents are exposed to significantly more dangerous diesel emissions. As a congressman, Emanuel was known by Great Lakes advocacy groups as an aggressive leader on environmental issues affecting the lakes. On the questionnaire he said he supported both disinfecting the city's wastewater, which makes up most of the Chicago River's flow, and expediting the ongoing Army Corps of Engineers study on separating the Chicago River system from the Mississippi River to prevent the advance of invasive Asian carp. But he offered no specific proposals, and he didn't address either the infrastructure implications—re-reversing the Chicago River could cut off Chicago-area canals from Lake Michigan—or the significant funding needed to make either change. All the candidates said they'd enforce the existing codes limiting storm water runoff. But fully addressing Chicago's flooding problems isn't easy. Runoff could be reduced by infrastructure improvements such as permeable pavement, green rooftops, bioswales, and rain barrels. But installing permeable pavement on a large scale would be expensive, and sidewalks, parking lots, and streets would have to be torn up. On the questionnaire, only two candidates elaborated at all on their views on runoff, with del Valle saying he'd make managing storm water "a priority" and Emanuel saying he'd order a "multi-year plan." All the candidates said they'd support locally grown food. Del Valle said he's a big proponent of hydroponics and urban agriculture—using vacant lots and public land to grow produce in low-income communities—and thinks the city should move more quickly to change zoning laws and otherwise support urban agriculture. The questionnaire also asked the candidates if they'd make source-separated recycling available to all homes and businesses by 2014. Emanuel and del Valle said they're for it but wouldn't commit to a 2014 deadline. 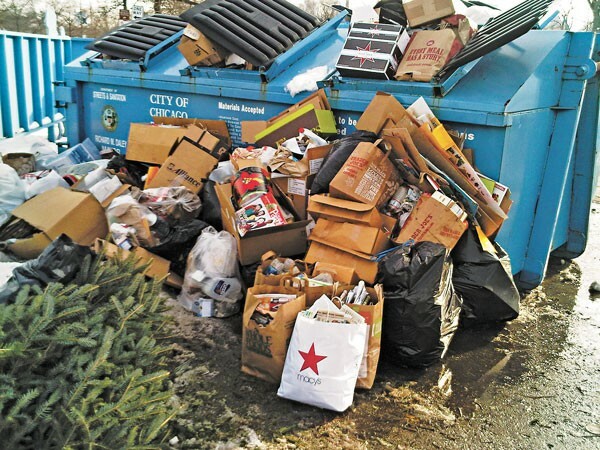 Del Valle added, "If we're going to commit to recycling, we're going to have to consider how to pay for it," and he said the funds might have to come from charging fees and partially privatizing the service. However, he promised to do that "the opposite of how the parking-meter deal was handled." Care to comment? Find this story at chicagoreader.com/politics.